Cookies & Candies: What would you do if you weren't afraid? Two good things came out of being bedridden with the flu for two weeks over the Christmas season - I had a lot of time to read and think. Secondly, I lost a ton of weight (which I regained soon after. The joy of having a flatter tummy and skinnier thighs was undeniably fabulous while it lasted. Pffffftttt). 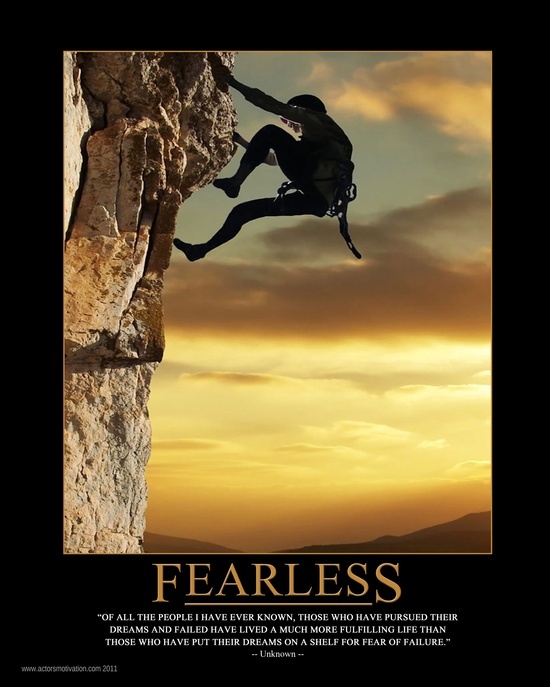 If I could turn back the clock, there was one thing I'd do differently - be more fearless. It was fear that held me back from taking more risks, being myself or taking the opportunities when they presented themselves. Over the course of the next 5 months, I spoke to friends, acquaintances, strangers, kids etc. The one thing that stuck out like a bright neon signboard was how fearful most people are. The fear of being ridiculed. The fear of appearing stupid. The fear of being laughed at. The fear of failure. The fear of being unable to handle success. The fear of rejection. Here's the thing - 99.5% of our fears lie in the realms of our imagination. It's crazy to think that the power of imagination is so potent that it can paralyze us and impale our dreams permanently. What's even crazier is that most of our fears never even materialize yet they can stop us dead in our tracks. In fact, most of us are so absorbed in their own worries and everyday trivialities, they don't have time to think about other people. But hey, what if we did look stupid? So what's the big deal? The Armageddon did not descend on planet Earth and decimate the entire population. Why do we take ourselves so seriously? You'll notice that if you laugh at yourself, others laugh with you, not at you. There's also an audible sigh of relief from those around you because they can relate to you. While we're on the topic of imagination. Imagine if Rosa Parks did not defiantly refused to give up her bus seat in 1955 in the days where the blacks and whites were segregated. There wouldn't be a launch of civil rights movement soon after with the removal of legal color bars. Bit by bit, many in Malaysia have taken a step to speak out against the corrupt government despite the threat of imprisonment and other bullying tactics by the officials. If you're a parent, what kind of impact will you have on your kids if they see you feel the fear yet do it anyway? What would be the butterfly effect if you'd stepped out of your comfort zone and did what you've always wanted to do? I've never worried about looking stupid or daft but fear has held me back in many other ways, if I felt more secure in the world I think my life would look very different. Such an interesting topic to touch on. Love this post and its quite ironic that I'm just back home from a meeting in which I am put in a position to answer that exact question- what would I do. And while I am no longer a fearful person in terms of living out my life and passions, I spent SO much time being afraid that now when opportunities are flowing in I am jaded. And my dream is to be a mom one day. I wouldn't want my daughter thinking the way I did, afraid of being a minority, afraid of being intellectual but also infatuated with frivolity, afraid of leaving home, afraid of taking chances, afraid of the unknown. Guess this will take some thought! I used to have this fear of not being accepted by others around me, then I learned there is no such a thing as pleasing everybody. If I appear to be accepted by some I would still be not to others. Then I started thinking, what about me? I had my fair share of ups and down, and I guess I am old enough to say I am more important than what others think about me. It is a shame what is happening in Malaysia, right? I left the country 9 years ago and when I turn back it is unrecognizable! I have never cared about looking gormless or stupid (I'm always the one under-over dressed or says the wrong thing or makes a stupid joke - the only thing that saves me is being a Kiwi so people put me in a category of my own) I think the thing that always holds me back is being a perfectionist. My friend does everything just good enough and moves on and she is taking over the world here.